Somewhere off the Lagos coastline, on the Lekki Peninsula stretch is Marwa, a sprawling shanty settlement and haven to hundreds of homeless children. For many people who work or live in the hinterland of Lekki-Epe Expressway, Marwa probably only resonates as a designated bus stop at the second round-about. From an outer-shell glance, the Marwa bus stop and the highbrow Lekki are characterized by grandeur, class and luxury. What is least known is that there is, tucked behind the hectares of magnificent real estate, a slum with its squalor, gripping poverty and hundreds of homeless children and families living without a hope for the future. It is quite an irony that slums are almost an unavoidable feature of mega cities world over. For Lagos, the massive influx of people in search of greener pastures, both from within and outside Nigeria, into the metropolis presents an overflow of opportunities as well as a grave challenge in terms of land space constraint and rising population. This is now being depicted in the number of homeless people and slum settlement with unseemly shelter and sanitary condition. Marwa is one of the many squatter-areas in Lagos. Home to all sorts, especially street urchins, drug addicts and prostitutes, the residents live in shanties made of nylon twined to wooden poles, stuck in the white sand. This provides only the barest protection from the elements and at first sight; it is needless to say that the standard of living is far below average. Perhaps more alarming is the large number of out-of-school children that call Marwa home. Children roam the streets of Victoria Island and Lekki, begging and cleaning car windshields in traffic. With Marwa, one wonders if the United Nations did not underestimate the population of Nigeria’s illiterate children when it revealed the country has the world’s largest out-of-school children at over 10 million. However, as Nigeria celebrated her 54th Independence anniversary, a gleam of hope came to children at Marwa through the initiative of the Destiny Trust, a social intervention providing care, rehabilitation education and empowerment to homeless children and children in disadvantaged communities. Despite the fact that the Lagos State government provides tuition-free basic education, many children in slums like Marwa still do not attend school for many reasons. Being illegal occupants of land, they live daily in fear of eviction by property owners and enforcement agencies. For this reason, they believe it is fruitless enrolling children in school when they can be taken from the proximity of the school at any time. Some parents do not even know that the state offers tuition-free basic education. “I know there is a government primary school near Mobolaji Johnson Estate inside Lekki but I can’t afford the cost. They said registration is N7,000 and we will pay N2,500 per term,” a woman, who identified herself as Mama Favour stated. Others told The Guardian that they couldn’t afford the cost of school materials like books, bags and school uniforms. Some of the children who had started school earlier dropped out. Chika, aged 12, said he quit schooling when his parents got separated, but said he does not mind returning if someone can assist his mother by providing him with learning materials. Matthew is no different. He has had to serve as apprentice at a mechanic workshop for years now instead of getting an education. 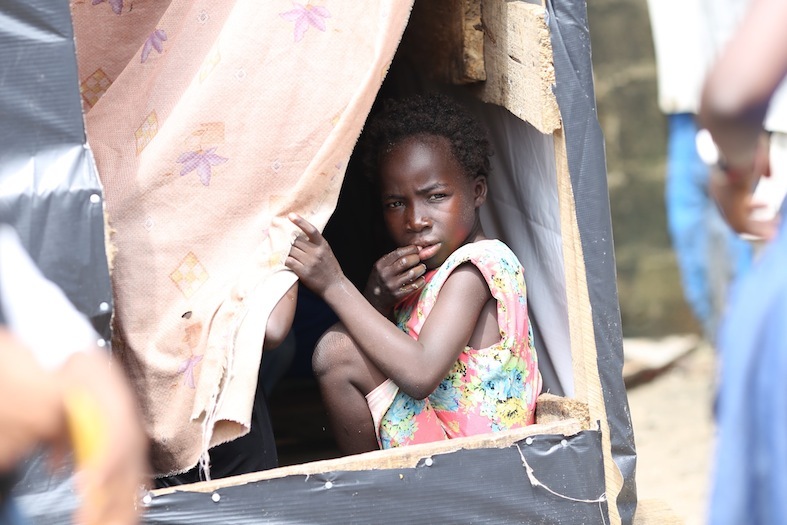 Parents in Marwa have other fears that have kept them from enrolling their children in the nearby primary school, which is just across the road from the slum. Mrs. Mary Ifegbunam said some children have disappeared in mysterious circumstances and there is widespread suspicion that the rich in Lekki use them for money rituals. They also expressed concerns about children crossing the major highway to attend a school due to the danger posed by movement of vehicles on high speed. Speaking on the intervention of the Destiny Trust, coordinator of the group, Mr. Abimbola Ojenike, noted: “It is a serious concern to us that Nigeria has the unenviable status of the country with the world’s largest number of uneducated children. We know child illiteracy is depleting the nation’s human capital, increasing crime tendencies and poverty and the worst is yet to come if we don’t act. “Although this is a broad institutional problem that individuals cannot completely solve, we believe that the combined effort of individuals can have major impact. For us, the starting point is to sensitize parents about the importance of education and the consequences of uneducated children to the nation. We are correcting the wrong assumptions that have misled some parents to keep children away from school despite the opportunity of tuition-free education offered by the state. “Also, we are providing books, writing materials, uniforms and bags to children so that no one has an excuse for being out of school. Furthermore, we are organizing an after-school assistance programme to help the children cope with learning difficulties that may be due to delayed enrolment in school,” he said. Matching words with action, the Trust is providing education sponsorship to 100 children with the support of compassionate Nigerians who gave to a social media campaign tagged: #1000HelpingHands. 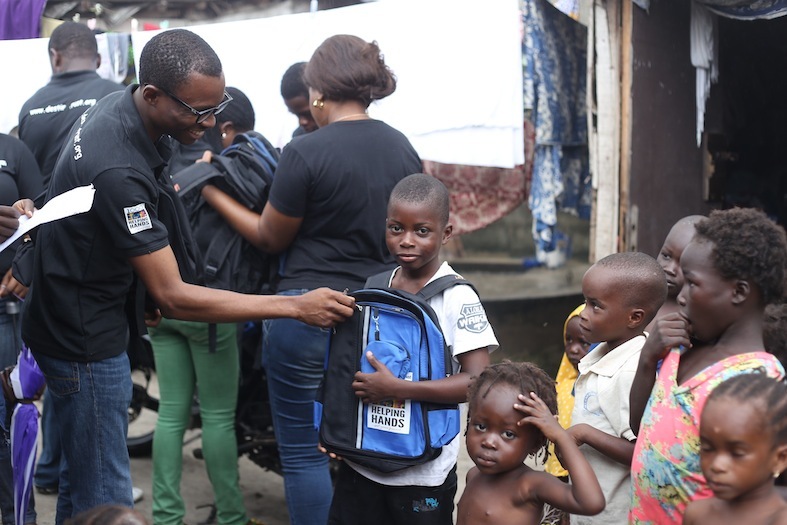 The campaign, which commenced on August 1, 2014 and lasted for a month, was able to raise funds from 1000 people giving at least N1,000 to support the education of 100 out-of-school children in various squatter areas and rural communities. 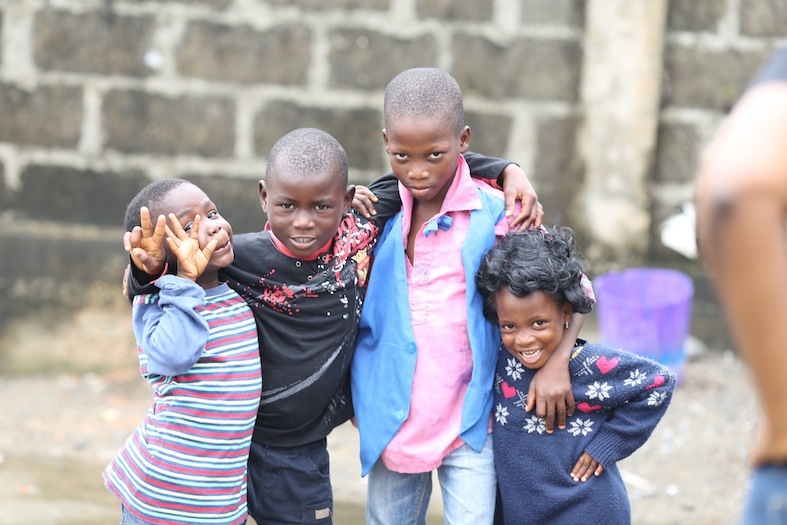 A few of the indigent children lacking parental care have been resettled into the Trust’s residential learning and rehabilitation centre at Ibeju-Lekki, Lagos. 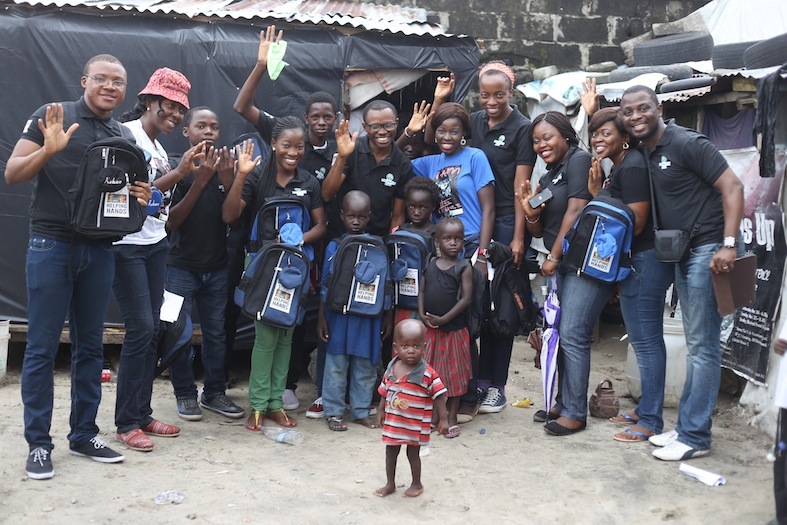 The Trust is supporting 43 children in Marwa and 57 others from Bogije and Okun Solu-Alade communities in Ibeju-Lekki. The Destiny Trust volunteers invaded Marwa on Independence Day and by the time they left later in the afternoon, the cheer had gone round the slum and the glee of children told the story of hope restored. Nigeria is a middle-income, mixed economy and emerging market, with expanding financial, service, communications and entertainment sectors with eyes set on potentially becoming one of the 20 largest economies in the world by 2020. Its re-emergent, though currently under-performing, manufacturing sector is the third-largest on the continent, and produces a large proportion of goods and services for the West African region. As a result, it is a busy hub for business activities. One of its biggest trading partners is the United Kingdom. 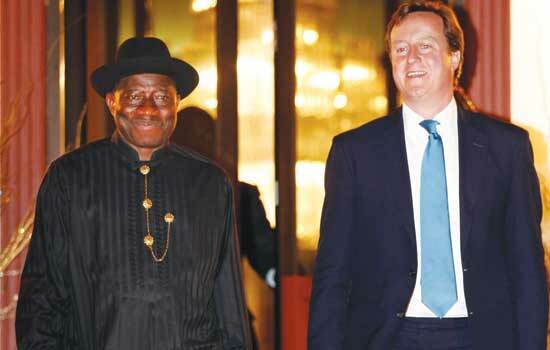 Presently, Nigeria is UK’s second largest trading partner in Africa after South Africa. The drive for improved trade and economic relations made the leaders of the two countries, President Goodluck Jonathan and David Cameron in June 2011 set an ambitious goal to double bilateral trade to eight billion pounds by 2014. But then, how much of this ambitious relationship has been beneficial to the country and its citizens? 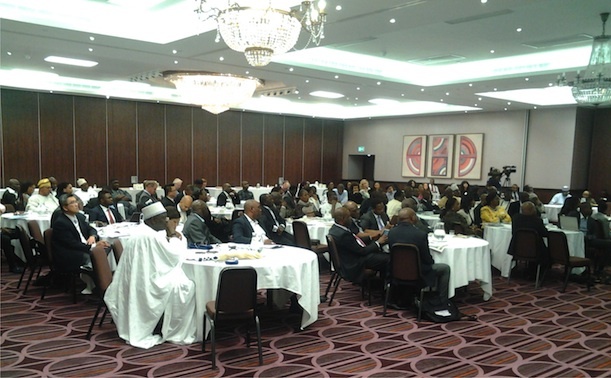 The search for answers to the question of trade imbalance between Nigeria and the UK was the kernel of discourse at the recently concluded Greater London Business Conference on Nigeria, which held at the Royal National Hotel, London. With the theme ‘Nigeria in the MINT’, the conference was anchored by the Nigerian London Business Forum (NILOBF) in conjunction with the Nigerian High Commission in London and the British High Commission in Nigeria. It had in attendance government agencies and Nigerian companies drawn from various local chambers of commerce. 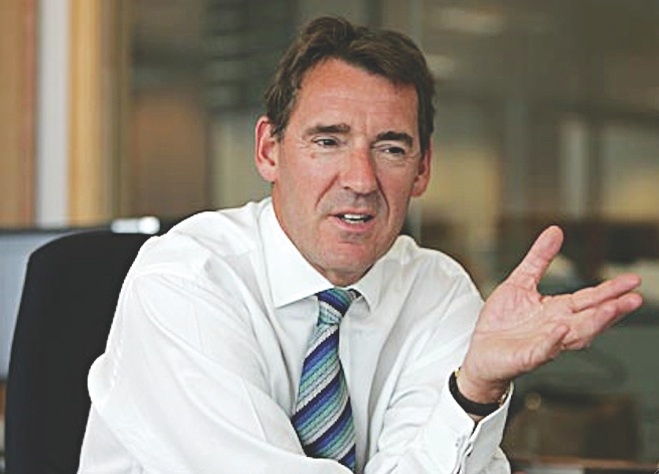 The term, MINT – Mexico, Indonesia, Nigeria and Turkey – was originally coined by Fidelity Investments, a Boston-based asset management firm and popularized by Jim O’Neill of Goldman Sachs, who predicted the MINT countries as the next most powerful economic bloc. The conference sought to promote bilateral trade and investment relations between the two countries by bringing together business people from Nigeria and the UK to seek new investment opportunities, develop long term business relationships and finalize existing business contracts, while enhancing existing structures and removing hurdles capable of frustrating the flow of trade and investment between the two countries. Interestingly, of the four MINT countries, Nigeria’s population is projected to outstrip other MINT countries by 2050 with population set to hit 402 million people. Of the four countries, Nigeria and Indonesia have the most consistent GDP at around six to eight per cent. The two countries have the lowest GDPs of the four MINT countries, at $1,555 and $3,557 per capita respectively, compared with $9,749 in Mexico, $10,666 in Turkey, and $51,749 in the United States of America, according to 2012 figures from the World Bank. Declaring the event open, conference director, who is also the Registrar/Chief Executive Officer of the Institute of Credit Administration (ICA), Dr. Chris Onalo, said the forum was an opportunity for the Nigerian delegation to meet British investors, associates and partners. “We expect that at the end of this event, strong business partnerships and investment would be formed and the trade and investment relationship between UK and Nigeria will propel to new heights after two days of fruitful discussions on business, trade and investment,” he said. Onalo, however, urged the Nigerian government to work closely and pragmatically through its relevant agencies with the British government with a view to creating further improvement on efforts to remove needless obstacles perceived to be seriously hindering a robust business, trade and investment engagements of business people of the two countries. “There is need for the government of the two countries to make less stringent, special requirements to be met by business people for business visa applications so that the people in the two countries can easily and frequently meet and interact with each other in order to encourage appreciable economic, trade and investment expansions between the two countries. “For instance, it was decided that there should be a fast visa application process for business men and women who are members of any credible registered local chambers of commerce and trade associations in the two countries. “This suggestion was initiated by the Nigerian London Business Forum in the UK and endorsed in Lagos by Peter Carter, the Deputy British High Commissioner to Nigeria, who sadly passed away earlier in the month for which the conference observed a one minute silence. This conference aims to bring us all together to build investment and business and we expect that at the end of this conference, new partnerships will be forged,” he said. Hassan Mohammed Hassan, the Minister of Industry, Trade and Investment at the Nigerian High Commission in the UK, who stood in for the High Commissioner, Dr. Dalhatu Tafida, added that the Nigerian government remains committed to drastically increasing the volume of trade between the two countries. He stressed that the goal of doubling trade volumes remains on course and even when it has been achieved, the bar will be raised high. 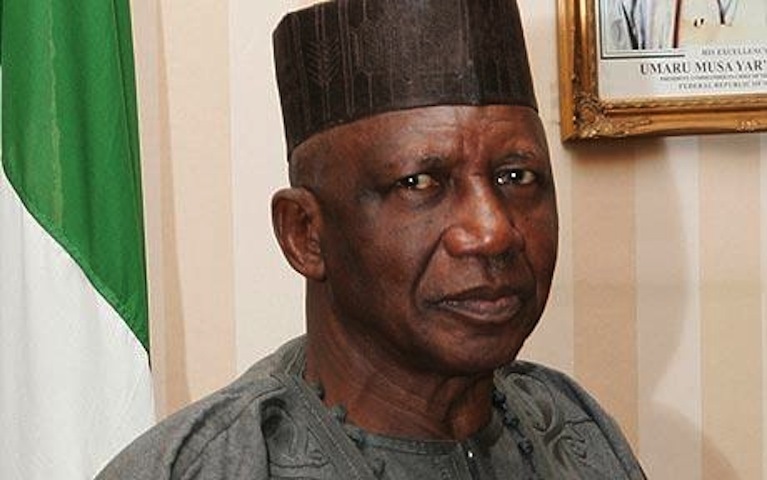 Hassan said: “In 2011, President Goodluck Jonathan and Prime Minister David Cameron decided to double trade between both countries to £8 billion. Between November 2011 and now, almost 85 percent of that has been attained, especially in the areas of oil and gas and we are trying to come up with another projection. According to the minister, British economist, Dr Terrence O’Neill, who coined the phrase MINT countries, could see that Mexico, Indonesia, Nigeria and Turkey would impact positively on the world stage over the next decade. He added that this process has already begun in areas like telecoms, where Nigeria now has eight million phone lines and this can be replicated in sectors such as agriculture and education. An international trade advisor at the UK Trade and Investment, Raphael Channer, said British exports currently total £500 billion and the target is to double this to £1 trillion by 2020 with increased sales to markets like Nigeria. He added that this would mean the number of companies increasing from the current ratio of one in four firms to one in five. David Tang, from UK Export Finance (UKEF), the operating unit of the UK’s Export Credit Guarantee Department (ECGD), added that his export credit agency organisation helps to provide guarantees for exporters to banks and also assists overseas buyers seeking loans. He added that UKEF offers support ranging from as little as £25,000 to as much as multimillion pound deals. For Muhammed Aminu Muhammed, the immigration attaché at the Nigerian High Commission in the UK, he is confident that the UK and Nigeria will achieve the target of doubling trade volumes between them despite problems like security challenges. He added that the Nigerian Senate is currently debating on a bill that will ease restrictions on visa applications for business customers, which will include among other things, the issuing of visas upon arrival. Peter Bishop, the deputy chief executive of the London Chamber of Commerce and Industry, said that his organisation visits Nigeria every year in the drive to boost trade. He added that Nigeria gets a bad press in the UK, which misleads a lot of businesses but anyone who walks round London will see the contribution the Nigerian in diaspora makes to the UK economy. In his contribution, president of the Port Harcourt Chamber of Commerce, Industry, Mines and Agriculture, Emeka Unachukwu, said UK trade with Nigeria is on course to double to £20 billion in 2020, thanks to several incentives provided by the government. He added that this will include a three year tax holiday for investors coming into the gas sector and import duty exemptions for equipment used to build processing infrastructure. According to Unachukwu, the Nigerian government is looking to expand sectors like gas as well as solid minerals like coal, lignite and tar sands. He pointed out that gas in particular has huge potential as Nigeria has the ninth largest gas reserves in the world, 187trn cubic feet and is working on a West African gas Pipeline and a Nigeria-Algeria Gas Pipeline. The Oyo State governor, Senator Abiola Ajimobi, at the conference, said his administration is optimistic of achieving 75 per cent self-sufficiency in food production within the next five years as part of a master-plan to make the state economically self-sustainable, as other delegates explored the huge potential that exists in Nigerian business environment. To achieve this, he said his administration has put in place several ambitious plans to increase agricultural output, while boosting other sectors such as housing, transport, tourism and education, in the bid to make the state independently viable in the long term and boost its Internally Generated Revenue (IGR). Addressing a huge gathering of business leaders from the UK and Nigeria, as well as government officials and chamber of commerce executives, Ajimobi said Oyo State currently has a Gross Domestic Product (GDP) of $2.3 billion, a population of seven million and a literacy rate of 62.6 per cent. The state is also striving to improve productivity to catch up with consumption. “Oyo State is bigger than Gambia, Equatorial Guinea, Belgium and Israel in terms of population but our GDP is only $2.3 billion but the annual growth rate is 14 per cent. If you look across the MINT countries, Nigeria has the highest illiteracy rates and the highest unemployment rates, but we are working to address all these problems. Confident that his administration will succeed in providing the necessary social amenities and an enabling environment for economic growth, Ajimobi said his government is always on the lookout for private sector partners to work with. He listed housing, agriculture, education and infrastructure development as sectors in which his government is looking for private sector partners willing to invest. “We have companies partnering with us to build houses and among them are Spanish, United States and indigenous firms building houses for low, middle and high income earners. In agriculture too, we are looking for partners as the Food and Agricultural Organisation (FAO) has recommended that there be two tractors per hectare of land but at the moment, we have achieved less than that, compared with Asian countries that have reached. Other areas the governor said his administration is working hard on is business registration, in a bid to ensure that private sector operators willing to operate in Oyo State can get their business registered within 48 hours. He added that to encourage such investors, the government is giving them all sorts of incentives such as 30 per cent tax concessions for five years. The conference ended with presentation of the prestigious Honorary Member Award of the Nigerian London Business Forum to Senator Abiola Ajimobi and Dr. Mua’zu Babangida Aliyu, the governor of Niger State. Also, over 20 British and Nigerian companies received their certificate of membership of the forum for trade and investment promotion and bilateral policies lobbyist.